AIP Language Institute is a language school which allows you to not only practice your spanish but also to get to know the spanish culture in the beautiful spanish city of ValenciaLocated in the heart of a historic district and at a 15 minute walk from the city center, AIP Language Institute gives you the opportunity to discover an ancient city at the Mediterranean coast. Also known for its City of Arts and Sciences which is a spectacular space of futuristic architecture. Valencia is the 3rd largest city in Spain, after Madrid and Barcelona. A city with over 2000 years of history reflected in one of the largest “old town” of Europe. With one of< the best climate in Spain (an annual average temperature of 15 ° C). AIP Language Institute offers Spanish courses in a nice and modern area of ​​850 square meters with a capacity of 150 students. 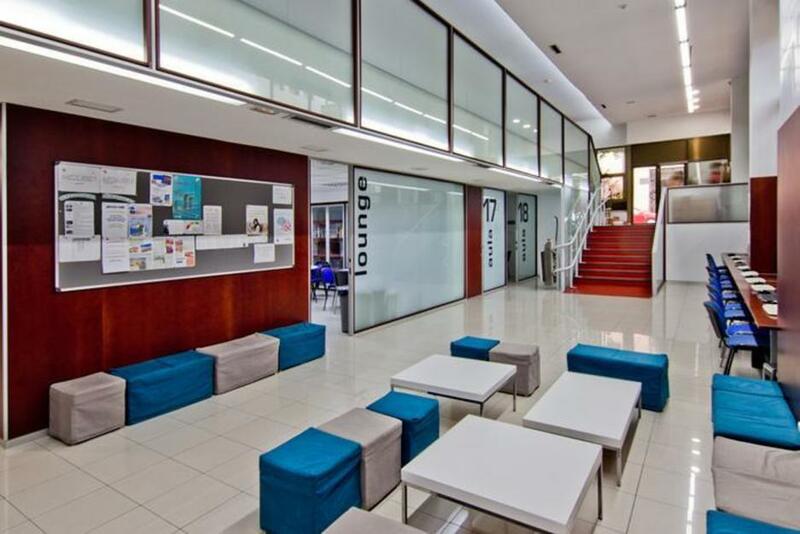 Our Spanish language school, located in Valencia, guarantees its students a modern workspace with a warm decorand a good working environment to study Spanish in Valencia. In addition to our courses, we offer weekly cultural activities – trips, study tours and meetings with spanish natives for students to stimulate the learning process by practicing outside school hours and also to give the opportunity to experience a true cultural immersion . This course consists of 4 Spanish lessons per day (20 weekly lessons) of Spanish General Skills; from Monday to Friday from 9.00 to 13.00. Spanish classes are available at all levels: elementary (A1), intermediate (A2), upper intermediate (B1) and advanced (B2 and C1). This course is addressed to everyone! It does not matter if you have never learnt Spanish, your knowledge is limited to a few words or you have an advanced level but you are ready to work on your technique and progress steadily. you will develop the four basic language skills(listening, speaking, reading and writting) in Spanish while having time to enjoy Valencia through the weekly organized activities by the school. DELE is the only official certificate of the Spanish Department of Education in Spain and it is administered by Instituto Cervantes. It is internationally accredited and can be extremely useful for your future, whether you are looking to start a career, get a better position within your company or if you intend to study at any Spanish institution or university. AIP Language Institure gives the opportunity to prepare the DELE exam. Schedule: 4 daily lessons, Monday to Friday. All levels. We cover all the different parts of the exams. Minimum 2 weeks, maximum 4. We strongly recommend the 4 week package to be well prepared for the exams, although the student’s success always depends on his or her previous knowledge. If the student is a total beginner, you can choose the following starting dates: 1st, 8th and 22nd of July. If the student already knows some Spanish, even if it is an elementary level, he/she can start any Monday. The price depends on the number of weeks you wish for him to attend; if you already found accommodation, you can book just the course and activities and it would be a different price as well. La escuela está bien colocada, los profesores son preparados y jóvenes, la gente es muy alegre también. ¡La recomiendo! Además cada semana la escuela organiza actividades por la tarde para explorar y vivir Valencia. me gusta esta escuela. los profesores son muy amable y responsables. los profesores son preparan por los enseñanzas. Los cursos son muy interesantes y me alegar estudiar español. Lecciones interesantes e interactivas, buenos profesores. Precios justos y servicio impecable por la tarde. Aprendí mucho y estoy seguro de que he mejorado mucho mi nivel de español. The concept that is being offered by AIP is good. Overall my daughter was safe, learnt some Spanish, made some friends and got to know her way around a new city and these are all positive outcomes. On a lesser note, the school may pay more attention to the teaching programme. She often felt that she was already familiar with the topics being discussed and the delivery of the classes was also often somewhat dull and hard to engage with. However, the thing that spoilt my daughter's stay in Valencia was overwhemingly the 'home' experience with her host mother. Unfortunately, the person who was supposedly responsible for welcoming a 16 year old in her home, complained incessantly (that is every meal time) that she was vegetarian, even though this was beforehand stated in the registration papers. She even put meat in one of the dishes and gave it to her. When her friends were offered salad, she had to ask for salad. When she did present vegetarian food, it was in such small amounts that my daughter invariably left hungry. While the other two persons residing with this host family got a fan for the room,she did not. Overall she was openly unfriendly, calling her 'crazy girl' in Spanish and not even engaging with her on a courteous level. As a mother, I was dismayed to hear these stories on her return. You may ask why I did not complain beforehand. Well, apparently, the daughter of the host mother works at the school and although my daughter met and liked this person, it would still have complicated Saskia's stay considerably. Thank you very much for your feedback, be sure we will keep it in mind for future reference so we can avoid such a situation in the next programs. I want you to know that this host lady is actually the mother of one of our teachers but she has also hosted students for many years with excellent results; we informed her in advance about the fact that your daughter is a vegetarian and she has lots of experience hosting other vegetarian students, so we trusted her judgement. We are confident she did not mean any disrespect towards your daughter but we will talk to her to make sure she remembers how sometimes the language and cultural barrier can lead to misunderstandings, specially in such young ages. That said, it is important to note that, if your daughter was uncomfortable with the accommodation assigned, she was free to come to talk to any of our supervisors to elevate a complain or even request a change of host family. Besides, I inform you that all participants in our programs fill two assessment forms, the first one, the first week they arrive to the school, and the 2nd, the last day at the school. We have not seen a complaint of your daugther on theese forms. So, we thougth she was having a good experience with her host mum, as she did not inform us (oral either written) once she was here. The school takes the students’ concerns very seriously regarding their accommodation since we believe it is the defining factor in the enjoyment (or lack of it) of the whole experience and we treat them with absolute confidentiality; our policy guarantees the change in accommodation in 24 hours for any student asking for it, no matter the reason. Once again, thank you for taking the time to write your feedback with such a detailed and sincere response and, please, accept our apologies for all the trouble we may have caused your daughter and we are really sorry her experience did not live up to her expectations. I took an intensive Spanish language course for two weeks, in order to prepare myself for my internship. The classes were very professional and personal, with the best teachers in town. I met a lot of people within a short amount of time and the activities arranged by the travel agency give the oppotunity to get to know the city very well. AIP Language Institute es una buena escuela para aprender la lengua de español, estaba en la escuela para un practicas y todo ha pasado muy bien, los profesores son muy amable y acogedora. Me ha gustado mucho la ciudad porque la escuela propone muchas actividades todos los días que es muy bien para descubrir la ciudad, entonces para una becaria es una buena idea de venir en la escuela porque propone mucho trabajo y es muy bien. Le recomendaría a todos las personas en Valencia. I have done a 3 months traineeship in AIP and i really enjoyed mi time there. The courses are very good, with young and well prepared teachers. The staff is nice and willing to help the students everytime. I really enjoyed my two weeks in the school. I was the only Danish person in my Class, and I loved meeting all the different nationalities.The teaching was very good and the organisation excellent. Everyone was friendly and helpful, and I would definitely like to return sometime if I can. Ya llevo unos meses como práctica aquí en la escuela. El ambiente laboral es fantástico, los profesores todos super disponibles para ayudar en cualquier ámbito y por cualquier duda. Además, actividades semanales siempre diferentes y chulas, un sitio super limpio, lleno de gente que afronta su trabajo de manera alegra sí pero también muy seria, eso denota la calidad con la que todos trabajan.